Everything you need to know about sponsorship! The best type of sponsorship for your situation! What sponsors really want and how to deliver it! 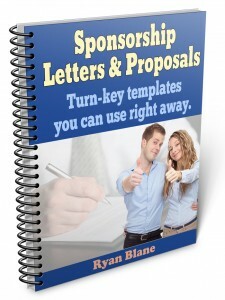 How to write a great sponsorship query letter! Secrets of winning sponsorship proposals! How to ace a sponsorship interview! Where to find sponsors that want you! 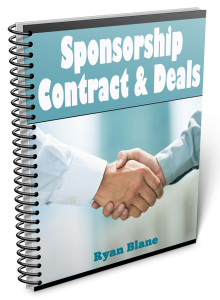 Secrets of effective sponsorship contracts! How to make yourself irresistible to sponsors! Find sponsors for just about anything! The Get Sponsored Fast Guidebook will show you little-known methods for you to literally get paid for doing what you already do or for what you want to do (you can get sponsored for practically anything you could imagine) by companies looking for people and events to sponsor. Simply put, you can use these sponsorship secrets to get sponsorship deals that can be in the six-figure range or even higher. It might sound too good to be true but with the right tools you can easily secure sponsorship deals for just about anything. The best part is that virtually nobody knows how to do this! What I’m talking is getting sponsors to pay for your events, gear, clothing, travel and even upfront cash payments. 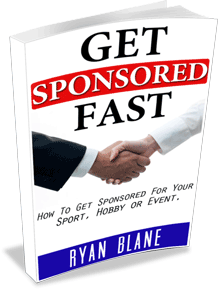 The Get Sponsored Fast Guidebook will show you how to do it. These 5 Bonus Gifts Are ALSO Included In Your Sponsorship ValuePack! Use this simple checklist as a cheat sheet to identify potential sponsors that may be a match for you. 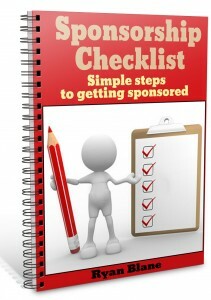 This checklist also gives you exact instructions for following up with sponsors until they sponsor you. This checklist and cheat sheet were developed from the exact steps others have taken to get successfully sponsored. (a $29 value). These are 11 actual insider sponsorship contracts and deal memos from 10 of the world’s largest sponsors. You can use these actual legal documents as a handy reference guide when negotiating sponsorship deals or you can use them to see how other sponsorship deals were structured (a $100 value). There are government grants for just about anything imaginable. Many government agencies have their budgets cut if they don’t spend all of the money allocated to them each year. Because of this many of them are constantly looking for people, businesses and events to give grant money to. There are literally hundreds of millions of dollars in government grants available. The odds are that you qualify for at least a few of them (a $37 value). This easy-to-use proposal template guides you through all of the important pieces of creating a winning sponsorship proposal. This will provide you with everything you need to get started right away. Plus, you’ll get dozens of websites that can match you up with a sponsor right away. This template alone is worth the cost of the book (a $49.00 value). If you don’t think this information is worth every penny you paid, simply email me and I’ll issue you a 100% refund on the spot. No questions asked, no hoops to jump through, no hard feelings and definitely no hassle. And if you decide to opt for a refund I still want you to keep the bonuses as my free gift just for giving this a shot.